Broadband Internet has made it possible for business owners to use Voice over Internet Protocol (VoIP) as their communication solution. Skype is the most popular and prominent solution for VoIP calling, but there are many other VoIP solutions available. High speed Internet expands the possibilities of VoIP. This revolutionary new tool allows clients to hold meeting and chat face-to-face with business partners from any location in the world. No longer are business people tied to an office. Several companies offer VoIP solutions and a range of accompanying tools. Cisco TelePresenceprovides customers with an affordable business-level VoIP solution. The solution is comprehensive. Even large businesses can use this solution with ease. Video conference calling solutions and VoIP PBX systems are the specialty of this company. Some solutions allow people to communicate via the Internet but have significant limitations. Clients who can handle the limitations may find the solutions workable. 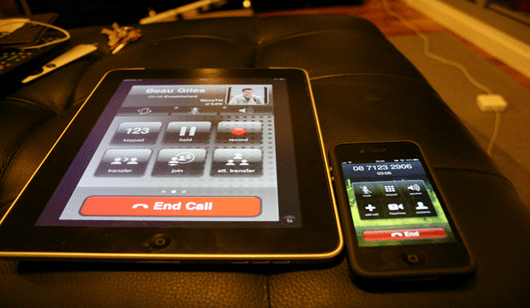 Facetime, for instance, allows people to communicate with one another via a VoIP-type technology, but users may only contact other Facetime users. If the person wants to call someone else out of the network, he or she will need another VoIP tool to make calls. Facetime’s limitations steer some users away from using the tool. Facetime is based on session initiation protocol (SIP) networks. Another SIP client is Ekiga. Ekiga is recognized for its exceptional H.323 video-conferencing technology. The technology is best known for its work with Linux VoIP technology, but the technology is also Windows compatible. Ekiga does integrate with older products such as Microsoft NetMeeting, but not with Windows Meeting Space. Google Talk and Google Voice are other VoIP solutions many companies use. Google Voice uses Google’s private branch exchange (PBX) telephony service. Google Talk combined with Google Voice and Google Chat provides users with a complete VoIP solution. The solution works as a video, landline and mobile phone service. Landline calls are most commonly made from Google Talk with a Google Voice account. Google VoIP may be used anywhere in the world, but the complete package is only for United States users. Linux and Mac users making use of Google Talk are required to install a voice plug-in and Google Talk before gaining full functionality of the tool. Before the introduction of Google Talk, OoVoo was one of Skype’s biggest competitors. The company does offer video conferencing, but the focus is not on the same line as Cisco TelePresence. The free version of this program gets fairly good reviews. The proprietary software gives OoVoo a competitive advantage. Most of the VoIP products still need work. Even Skype is not perfect in terms of voice and video problems. Broadband Internet has improved voice quality, but there is still some progress to be made before companies can rely solely on these systems without a backup plan. Many companies have written a disaster recovery plan to include other options should these programs fail. Even mobile devices may use VoIP in areas with high speed Internet. Technology is developing rapidly. Experts fully expect a solution in a few years to convince users to consider losing their landlines. Mobile phones have replaced residential lines in many households. Some people expect Skype to be replaced entirely. This occurrence will most likely be several years in the future. Until then, business owners can save money with VoIP solutions such as Skype and OoVoo. Consider trying a VoIP solution. The technology is affordable and fairly reliable. Search online to find other services if these solutions do not meet the needs of the business. This is a guest article by Ruben Corbo, a writer for the website Broadband Expert where you can find broadband internet providers in your area and compare prices on different deals for your mobile broadband needs.